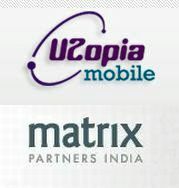 Singapore-based mobile value-added services (VAS) firm U2opia Mobile Pte Ltd has raised its first round of institutional funding from Matrix Partners India. Matrix was the only investor in this round. Although a representative of Matrix Partners will join the U2opia board of directors as a part of the deal, further details and the deal size had not been disclosed. The funds will be used to grow its employee base, operations and expand its global reach to emerging markets. U2opia will hire people for product & core engineering and business development, besides bringing on board several senior executives. U2opia was founded in 2010 by Sumesh Menon and Ankit Nautiyal. Prior to founding U2opia, Menon was a senior marketing director at Bubble Motion Inc., another mobile applications firm, and he is now an advisor there. Menon joined Bubble Motion from Bharti Airtel Ltd. Nautiyal was previously employed at Bubble Motion in Singapore and, prior to that, at Bharti Telesoft. He is now the VP (Engineering) at U2opia. U2opia had raised an angel round of funding from a consortium of international and Indian investors in 2010, which was used to set up offices and develop products. The company now has offices in Gurgaon and Singapore, with the majority of product development and operations being handled out of the Gurgaon setup. With the new infusion of funds, U2opia will add more offices in India and abroad. U2opia launched its flagship platform Fonetwish, for the first time, on Airtel networks in May this year. Since then, it has launched it with major carriers in the country, such as Idea Cellular, Vodafone Essar, Tata Indicom, Tata DoCoMo, Reliance Communications, Videocon and Tata Indicom. Fonetwish allows mobile users to access Facebook via USSD (unstructured supplementary service data) and was co-developed with the social networking major. Fonetwish reaches over 300 million users in India and Indonesia, of which 45 million are in Indonesia and serviced through the operator XL Axiata. "We have seen traction in multiple markets for Fonetwish and realised we needed to scale up fast," Sumesh Menon, co-founder and CEO of U2opia Mobile, told Techcircle.in. "Internationally, many carriers are looking at the social networking space. And there is a huge interest in our social networking platform from Asia to Africa," he added. According to Menon, the start-up is in talks with Airtel and MTN in Africa, as well as top operators like Smart Communications and Groove in the Philippines, to launch Fonetwish. U2opia's two other solutions â€“ Fonedoo, a mobile site where one can purchase mobile content such as caller tunes, and Fonebuy, a micropayment platform for virtual goods -- have been placed on the back-burner. "That's for the moment. We had done a fair amount of ground work for both the products but from a resource perspective, we are going to spend time on Fonetwish now," said Menon. "We will focus on social media and build on that. With Fonetwish, we have found our calling." Private equity firm Matrix India has recently invested Rs 45 crore in CloudNine or Kids Clinic India Pvt Ltd, which offers maternity and infant care in Bangalore. Earlier, it had invested in mobile classifieds start-up Verse Innovation, online classifieds site Quikr, Itz Cash Card, DVD rental service-turned-merchandiser Seventymm and online gaming company Ace2Three.com. It has $3 billion under management for the US, China and India investments. "We remain excited about the consumer mobile services opportunity in India and believe that mobile will be integral to the growth of social media in this country. We are excited to be associated with the team at U2opia and have been impressed by what they have been able to accomplish in a short period of time. We look forward to partnering with them on their journey," said Rishi Navani, managing director of Matrix India.